If there was ever a moment to unleash an adorable dog photo, it’s National Dog Day. Held on August 26th, National Dog Day was founded in 2004 by Animal Advocate Colleen Paige to recognize rescue dogs and the positive role dogs play in people’s lives. Over ten years later, the occasion has become increasingly popular on social media, with companies sharing a range of adorable photos, contests, information about charitable partnerships, and dog-friendly offices. So, which companies put their best paw forward? Look no further than these five examples. What better way to celebrate National Dog Day than getting up close and personal with a cute dog photo? While it’s no surprise that Petco jumped in on the National Dog Day fun with a few posts celebrating dogs, this image offers a great reminder that sometimes the best creative is simple yet sweet. 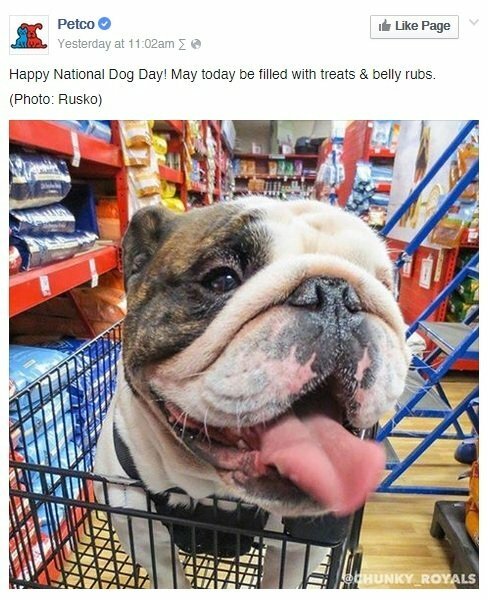 Look closer at the post’s comments, and you’ll see that Petco’s community agrees, as all of the comments are images of dogs wishing the company a happy National Dog Day. It’s hard not to love this adorable video of a dog getting a massage. In celebration of National Dog Day, Subaru leveraged this video to encourage nominations for its Pet Hall of Fame contest. While this contest is open to all pets, the timing of National Dog Day offered the perfect opportunity to tap into a targeted audience to promote the contest. Fans who enter before October 31, 2015 have a chance to win a number of prizes, from Bark Boxes to Subaru Adventure Seekers kits, and even the grand prize of an all-expense-paid trip for four to LA with VIP access to the CW World of Dog Awards. More importantly, the contest allows Subaru to highly its pet-friendly features, including “Share the Love” Rescue Rides, where Subaru and the ASPCA have partnered to transport thousands of animals from overcrowded shelters to those where they have a better chance of finding a home. Trending topics like National Dog Day also offer an opportunity to share important information. The CIA took this opportunity to raise awareness for the important work #K9 Officers and Trainers do. Throughout the day, the CIA posted a series of tweets, from dog training tips to stats on the work of #K9 Officers and Trainers. Although it’s a more serious subject, the content was still related to communicating the important role dogs play in keeping people safe, keeping it aligned with the purpose of the holiday occasion. It’s also a good reminder to always thoroughly research non-traditional holidays and trending topics to ensure that your message and content are appropriate for the occasion. Dubbed one of the top dog-friendly stores in the UK, Selfridges took to Instagram to ask its customers to share photos of their pups—with what else but the company’s iconic, bright yellow bags. The company featured a few of the adorable submissions throughout the day on National Dog Day, much to the delight of the company’s 400,000+ Instagram followers. This example offers a good reminder that occasions like National Dog Day provide a timely opportunity to tap into topics that your customers care about in a fun and engaging way. Instead of going straight for the sell—as Selfridges does sell pet apparel and accessories—the company chose to get fans involved. The images shared are very creative and showcase the Selfridges brand through their consumer’s eyes, resulting in far more relatable content. Happy #NationalDogDay! We’re starting the day with this little charmer @kobi_pug ? Use the hashtag #SelfridgesDogs of pics of your pooches & our icon bags for the chance to be featured today! ? Last, but certainly not least, our team of dog lovers at Sprinklr could not resist joining in the National Dog Day fun. 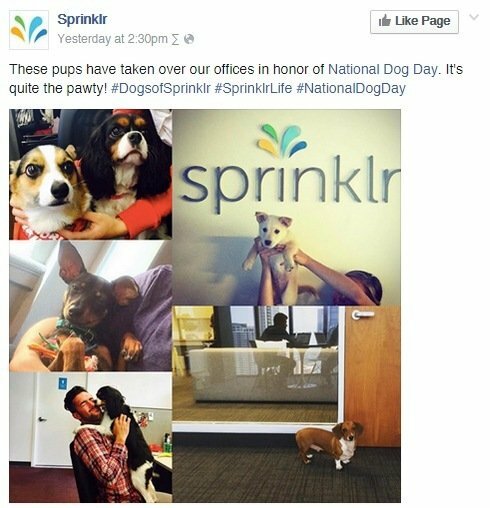 Holiday occasions like National Dog Day offer a great opportunity to do something fun for employees, while getting them involved in your social media efforts. Employees in our offices hosted National Dog Day parties with their pups, complete with doggie treats. Employees who work remotely were also encouraged to share photos of their dogs for a daylong social media celebration. As employees frequently post images of their dogs on social media sites, the occasion offered a great way for us to showcase an amazing part of Sprinklr’s corporate culture, while creating a fun day for employees—and their pups!